Bright fruity cocktails on white sand beaches, wood-fired smokers overflowing with jerk chicken, piles of weed… everywhere. Sisters Suzanne and Michelle Rousseau know the imagery often associated with Jamaica all too well. But when they set out to write their most recent cookbook, they had a different vision in mind. 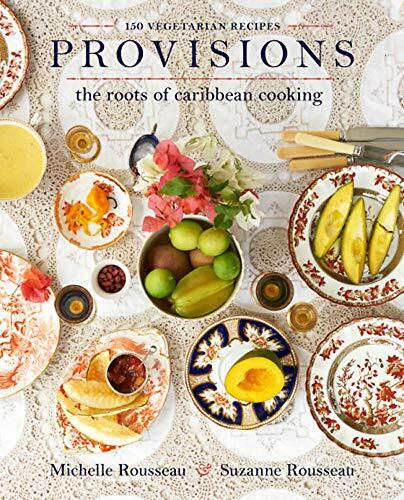 For the sisters, who have authored cookbooks, owned restaurants, and hosted television shows in Jamaica over the past 25 years, Provisions: The Roots of Caribbean Cooking, which was published at the end of 2018, was an opportunity to show readers another side of the Caribbean and its food. It was a chance to introduce readers to some of the women who have shaped the region’s food culture for generations, yet are rarely, if ever, acknowledged for their contributions. As they researched their book, the sisters were struck by how few stories they could find of women in their family and the larger community. When they did find documents, or hear stories, they were presented from a man’s perspective. The history of women in the Caribbean was largely a mystery, told at an impersonal, male remove. In collecting recipes and stories from the women in their community, the Rousseaus intended to retell history from a more personal, more intimate, and, ultimately, more accurate perspective. Take, for example, the story of the Rousseaus’ great grandmother, Martha Briggs. Over the years, the sisters had heard occasional stories about Briggs, who was famous in Jamaica during her lifetime for creating the first commercially available patty, a combination of meat and spices wrapped in flaky pastry dough and baked. But beyond her famous patty, details of Briggs’s life were always foggy, at best. In researching Briggs’s original patty recipe for their first cookbook, Caribbean Potluck, the sisters were able to piece together her story. That discovery repeated itself over and over again as the two sisters worked on the book. The more women the sisters met with during their time traveling to collect recipes, the clearer it became this was not just going to be a book about Caribbean ingredients and foodways, but one that would celebrate and seek to cement the legacies of the islands’ women. On one trip to Saint Kitts, Michelle met a young man who remembered with crystal clear detail the way his grandmother used to make flour from sun-dried breadfruit, as there was no wheat flour being imported to the islands during World War II. A young Haitian woman fondly recounted stories of her mother, a community baker, who made Christmas cakes each year for her entire town. Her mother added fruit for the cakes to a vat of rum throughout the growing seasons, built her own oven, and incorporated her spiked rum and soaked, fermented fruit into the cakes before she baked them. The stories they’ve collected are packed into the book’s introduction, squeezed into recipe headnotes, recalled in the final acknowledgements. But, of course, some of the fullest stories are contained within the recipes themselves, and speak of the incredible ingenuity, resourcefulness, and skill of generations of Caribbean women. There are pumpkin pancakes, a recipe gifted to the sisters by Oma Chepa, their friend’s grandmother in Curaçao, a tiny island just north of Venezuela. And there's the “apple crisp” their mother made when they were children, only instead of apples, she made it with cho cho, also known as chayote, a variety of squash local to the Caribbean. There’s Aunt Marjorie’s cheesy gratin, made with leafy callaloo greens. Tammy Hart, a fellow chef in Jamaica, gave the sisters a recipe for falafel made with fresh Jamaican gungo peas in place of chickpeas. Then there are Aunt Winsome’s scones, which replaced regular cream with coconut cream; Aunt Shirley’s guava jam; Mrs. Donaldson’s famous green mango chutney. No matter the circumstances, the available ingredients, through scarcity or abundance, these women found ways to adapt and cook delicious, bright food. The Rousseaus hope their book will help Caribbean and non-Caribbean readers alike understand the islands’ food from a new perspective, one that acknowledges and celebrates the countless contributions of women. But their deepest wish for the future of the Caribbean is much simpler than that. When the children of Jamaica, Saint Kitts, Antigua, Saint Martin, Barbuda, and the surrounding islands are let off early from school, or find themselves lazing on a Sunday afternoon, Suzanne and Michelle hope they end up in a mother’s or aunt’s kitchen, begging to know how she makes her most famous dish.